In March of 1927, Lyndon Johnson enrolled as a freshman at Southwest Texas State Teachers College — now Texas State University. Johnson majored in education and was active in various clubs and organizations, including the Harris-Blair Literary Society, the Schoolmaster’s Club, and the Press Club. 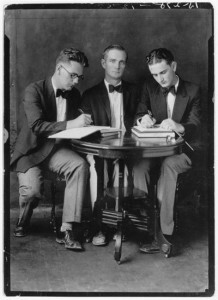 He was also a member of the debate team, wrote editorials for the College Star, and helped establish a secret college political organization called the Alpha & Omega (better known as the White Stars) in 1928. At that time the Black Stars, comprising mostly athletes, ran student politics, were given various social privileges, and controlled allocated funds for activities. With the campaigning and organizational talents of Lyndon Johnson, the White Stars elected some of their members to the student council and other important student government positions, and were able to divert funds for intellectual and cultural activities. It was during his college years that Lyndon Johnson first learned parliamentary procedures, formulated and expressed his political beliefs, and practiced his skills at persuading others face-to-face. 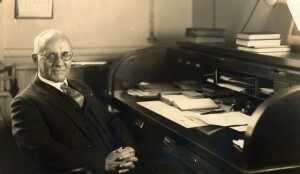 Cecil Eugene Evans was the college President during the time when Johnson was a student, and an important figure in the history of the development of Texas State University. Evans was particularly interested in improving campus facilities, upgrading his faculty, and working to get the college fully accredited. He also served as a mentor to the young Johnson by involving him in discussions about politics and taking him to Texas legislative sessions. President Evans employed Johnson first as a groundskeeper and later as an assistant to his secretary. On graduation day in 1930, Evans commended Johnson for his energy and hard work and predicted a promising future for the young man. Howard M. Greene, professor of government, also served as a mentor to Johnson. Prof Greene was a rugged individualist and unconventional free-thinker who inspired Johnson with a firm populist belief in the common man and a government that served the interests of the people. An interesting course Johnson took under Professor Greene was called “Problems of Organization and Control of the National Government.” Prof Greene was also Johnson’s debate coach and selected him to accompany debate team-member Elmer Graham to participate in state competitions. His college years played a significant role in Johnson’s priority to advance education and civil rights in America and in guiding through landmark legislation that vastly improved educational opportunities for all. 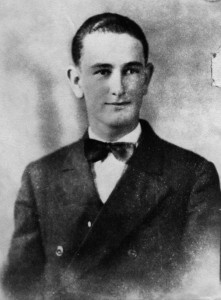 Lyndon Johnson had established a deep connection with his alma mater, stayed in contact with those who had influenced and inspired him, and at various times throughout his political career and life returned to San Marcos to speak at new building dedications, homecoming events, graduation ceremonies, and college president inaugurations. During the 1960s, President Johnson established the Gary Job Corps in San Marcos, transferred the Federal Fish Hatchery property to Texas State University, and signed the Higher Education Act of 1965 in the old Strahan Gym (now the Music Building). In 1971, Johnson came to San Marcos again to help dedicate the “LBJ at San Marcos” exhibit at the Alumni House and, before a crowd of about 8,000 people, read from his book The Vantage Point. 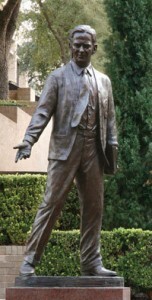 This statue, which sits at the quadrangle on Texas State University campus, was sculpted by artist Larry Ludtke and dedicated in 2006, the same year as the grand opening of the LBJ Museum of San Marcos. In 2007, the Lyndon Baines Johnson Federal Building in Washington, D.C. (Department of Education headquarters) was named in honor of the former president who helped to establish new educational standards for the United States.